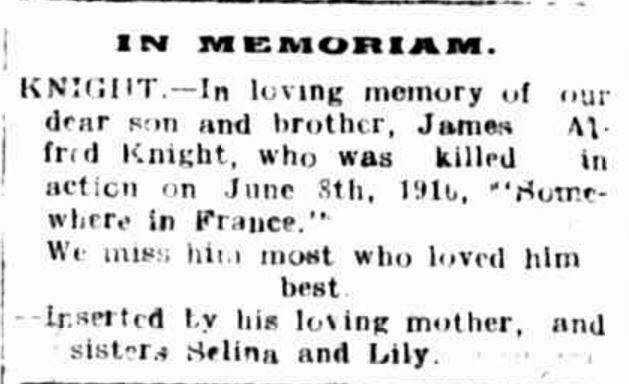 James Alfred Knight was born in Hamilton in 1874 to Thomas Robert Knight and Agnes Mason of North Hamilton. Thomas died in 1893 aged just forty-one in a wagon accident on Mt. Baimbridge Road. James was the eldest son. 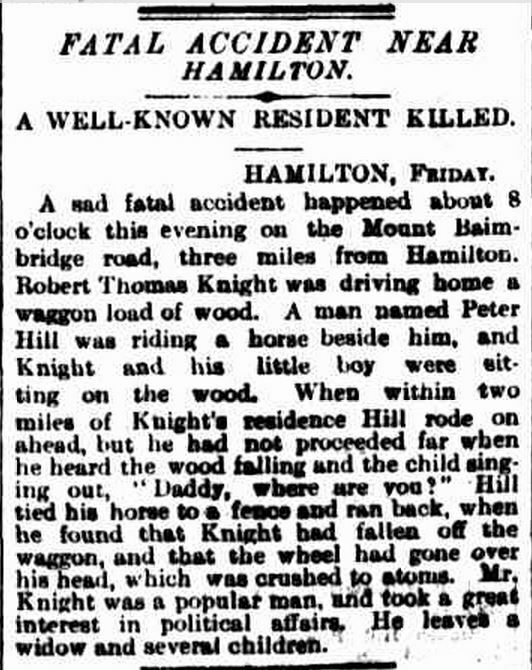 “FATAL ACCIDENT NEAR HAMILTON.” The Argus (Melbourne, Vic. : 1848 – 1957) 25 Feb 1893: 8. Web. 27 Jun 2015 <http://nla.gov.au/nla.news-article8519335&gt;. By 1905, James was living in Station Street, Malvern and working as the manager of Rayboulds Undertakers of Malvern. He’d married Lucy Langford Elliott in 1904 and in 1905 their daughter Honor Raybould Knight was born. “Family Notices.” The Argus (Melbourne, Vic. : 1848 – 1957) 19 Nov 1904: 9. Web. 27 Jun 2015 <http://nla.gov.au/nla.news-article10351176&gt;. James enlisted in Melbourne on 19 July 1915 and sailed with the 6th Battalion 12th Reinforcement in November. They arrived at Serapeum, Alexandria on 22 February 1916 but were moved on to the Western Front, arriving in France on 2 April 1916. By late May 1916, the 6th Battalion were at Fleurbaix and were mostly on fatigue duties or training. Training was the order of the day for 8 June when James Knight was killed in action at Fleurbaix. He was buried at Y Farm Military Cemetery. In 1917, a tree was planted by George Doig for James Knight along Hamilton’s Anzac Avenue. George was James’ nephew, a son of James’ sister Selina. There is the name of T.L.Knight on the Hamilton War Memorial I believe is intended for J.K.Knight. In 1924, James’ daughter Honour Knight married Frederick Funston at St. Joseph’s Church, East Malvern. His mother Agnes died at Hamilton in 1926.